I had a hard time coming up with a topic for tonight graveyard shift. Finally it hit me, gamer/pop culture clothing and accessories. I’ve bought my fair share of shirts that’s for sure. 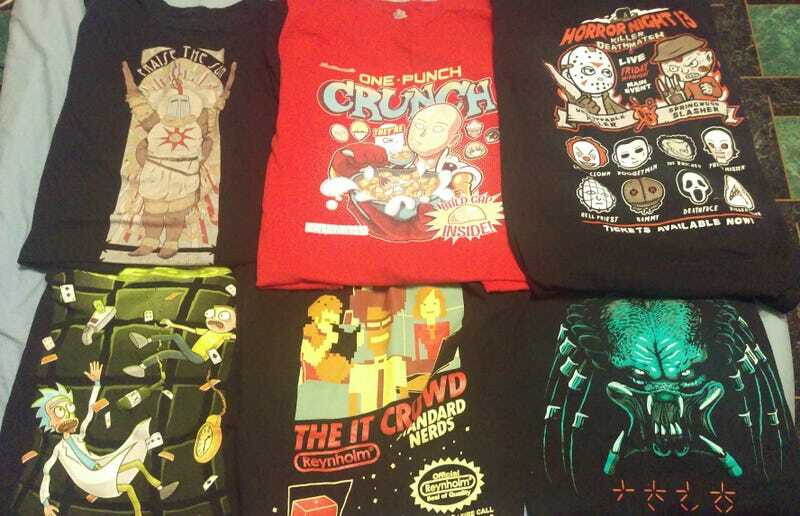 What you see above is only a small fraction of my t-shirt selection. I’m not one to hide from my pop culture awareness. Two shirts arrived just yesterday. These two I had bought from the AGDQ2017 collection, sold by The Yetee. The two I had purchased were labeled “A Link to the Fast” and “Light vs. Chaos” shirts. I bought another shirt yesterday and it had shipped today. I can’t wait for this one, let them know what’s what in Overwatch! Got any noteworthy shirts in your collection? What other gaming/pop culture accessories do you have? Not one to flaunt your inner geekiness! Well no worries! Talk amongst yourselves, The Graveyard Shift is open for business.